Regina Chabot and Jill Arnzen busy painting the fence at Greenlawn Cemetery Saturday afternoon. The 150-plus year-old cast-iron fencing that surrounds the 40-acre Greenlawn Cemetery continues to get a facelift. Last Saturday, over 100 volunteers worked together prepping and painting the historical fence on the section bordering Garfield Street. The entire exterior has now been returned to the original black color. All ages could be seen working side-by-side wire brushing, power washing and painting. Passersby could see once again something wonderful happening in Portsmouth. Public and private partnerships between the City of Portsmouth and local non-profits are making a difference. Volunteers from many area churches and schools as well as SOMC, Hope Source, Compass Community Health, the City of Portsmouth, the Friends of Portsmouth and the FOGCF Board Members and countless others rolled up their sleeves and joined together on this project. Over the past 16 months, many restoration and preservation projects have been underway at Greenlawn. Established in 1829, the cemetery encompasses 40 acres within the City of Portsmouth and is presently one of oldest working cemeteries in the State of Ohio. “A huge “thank you” to City Manager Sam Sutherland, Chris Tomlin, Service Director Bill Beaumont’s team and everyone from the City of Portsmouth’s workforce who helped make Saturday’s Community Fence Painting possible. What great support from our city. We are Portsmouth Proud,” Applegate added. Individuals will also see the partnership between the FOGCF and the Scioto County Career and Technical Center rebuilding the brick terraces that surround many of the sections within the cemetery, particularly on the Grant Street side. “The students completed some of the terraces last fall and we are extremely grateful they returned this spring to work on the remaining terraces that have fallen into disrepair,” Applegate added. “Funding for these projects has been through generous donors and the proceeds from the two historical reenactments “The Story of Us” held in October 2017 and 2018. The third installment of the “Story of Us” is scheduled for October 12 and 13th, 2019, so put it on your calendars! This two-night event will feature local actors, under the direction of Linda Tieman, portraying Scioto Countians who made such enormous contributions to our communities,” Gambill continued. Interior fence painting will continue and if you would like to participate or to arrange for your organization to help, please reach out to the Friends of Greenlawn Cemetery Foundation on their Facebook page. 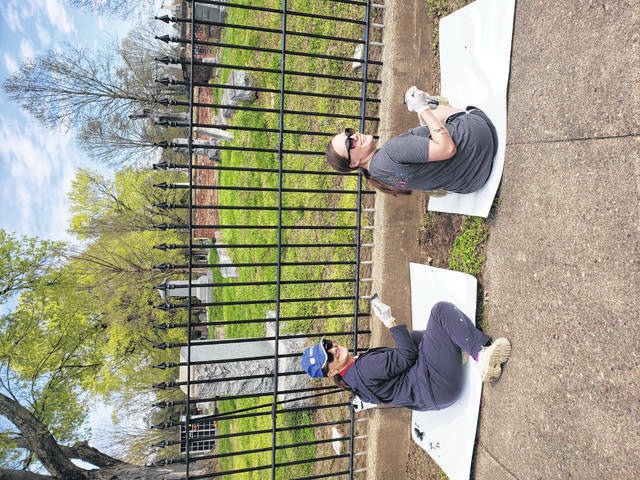 https://www.portsmouth-dailytimes.com/wp-content/uploads/sites/28/2019/04/web1_Greenlawn.jpgRegina Chabot and Jill Arnzen busy painting the fence at Greenlawn Cemetery Saturday afternoon.